<span style=”font-weight: 400;”>In business, “ship fire” is a term often used as a metaphor for a crisis with potentially catastrophic repercussions. This isn’t a coincidence. Every seasoned mariner knows that fire is one of the biggest dangers your crew, passengers, and cargo face at sea. And unlike a warehouse or office fire, you can’t really call the firefighters and hope they do their job well. It’s just you and your crew at sea. Your non-mariner friends might say something (really stupid) when you tell them that. “Fire? Dude! You’re at SEA! You’re, like, surrounded by water, man!” they might say. Okay, your friends might not sound like stoner surfers, but many out there think that ship fires are rare or easy to extinguish. Unfortunately, they are neither. According to research, fire outbreaks are among the most frequent causes of accidents at sea, in parallel with grounding, collision, and grazing contact. Every seventh fire outbreak culminated in the loss of life, and it was established that the most frequent outcome from a fire was damage to the vessel and inability to proceed with the journey. Fires don’t cause themselves. At sea, you can’t really blame the environment for causing fire. So who is to blame? You’re probably guessing already – people. Not by malice, usually, but by error. Reports suggest that “human error is a significant part of 70% to 80% of all accidents”. That’s quite a few accidents that could have been prevented through training and preparation. What Makes Ship Fires Special? Causes for ship fires tend to differ from those common on land, at least in part, for 2 main reasons. The first is electricity on vessels. You already know that electricity and water don’t mix, and when they do? Fire is often the outcome. The second reason is the types of materials used on ships, and their flammability. From the obvious fuels and lubricating oils for machinery to the conspicuous heat-producing bacteria in waste and sewage systems on an underway vessel. All these can ignite or provide fuel for the fire. Ship fires have a lot in common with aircraft fires. Unlike ground-based fires, when you’re in the air or at sea, you can’t just turn around and run in the other direction. Evacuation becomes much harder when your escape routes are limited. In addition, and as I’ve mentioned above, you can’t really call the local firefighting teams to help you out. Even if you manage to contact the nearest authority that can offer help, the fire won’t wait for help to arrive. And the help will usually take much longer to arrive than the few minutes it usually takes a fire-truck to reach a home or office on land. After the tragic sinking of the Titanic, international seafaring agencies and organizations created The International Convention for the Safety of Life at Sea (SOLAS) to try and minimize damage and casualties caused by ship accidents. This set of regulations aims to force all shipping companies to comply with minimum safety standards in construction, equipment and operation. The second chapter of this treaty is dedicated fully to fire protection, detection and extinction. It is also known as the Fire Safety System Code (FSS code). It was amended and revised in 2000 (and entered into force on 1 July 2002) to incorporate technological advances in fire detection and extinction, as well as lessons learned from fire incidents over the years. As a professional mariner, you should be well versed in the content of the most up-to-date SOLAS Chapter II. However, until you get around to purchasing and studying all 20 regulations and 15 chapters of this document in depth, you should at least know the basics before setting sail. To fight the fire, you need to know your types of fires, as each has its own prevention strategies as well as firefighting tactics. The types of fires on ships are classified by the type of fuel involved. Class A (General fire) – Common materials such as wood, paper and cloths are the main fuel for the flames. Class B (Oil fire) – The fire is fueled by flammable liquids like gasoline, oil and grease. Class C (Electrical fire) – Electrical cables, electrical motors and switchboards can be the source of the ignition, but can also fuel and spread the fire. Class D (Chemical fire) – Many of the chemicals often kelp onboard are flammable or combusting. Cleaning supplies, active metals and other chemicals on your ship are actually fuel in disguise. The best way to fight a fire is to prevent one, obviously. You should address the prevention of each type of fire according to the classifications above. Good housekeeping can prevent waste and grease from becoming fuel for a fire. When possible, use fire-retardant or fire-resistant materials in the construction or renovation of your ship. Define and enforce a fire safety policy for employees and guests on your ship. For example, smoking can be allowed only in specific areas of the ship. Restrict access to unused areas of the ship and keep those locked. Ensure proper storage of fuels and oil products. Maintain your fuel handling systems in top shape and avoid leakages of any kind. Thoroughly train the personnel handling fuel systems and demand all fuel system operation is done under supervision. Galley fires are often fueled by grease, and some even give it its own classification of Class K.
Use only properly maintained electrical equipment, and perform regular checks on electrical systems to discover potential fire hazards. Ensure proper electrical insulation, avoiding naked wires as much as possible. Where necessary, use weatherproof or explosion proof fittings. Switch off electrical equipment (like fans, lights and air conditioners) when not in use. It’s not only safer, but also less wasteful. Avoid prolonged use or overload of equipment, especially if it becomes hot when used. Carefully examine the storage and transport instructions of all chemicals that board your ship. Make sure your team follows these instructions to the letter, ensuring proper safety measures are taken. 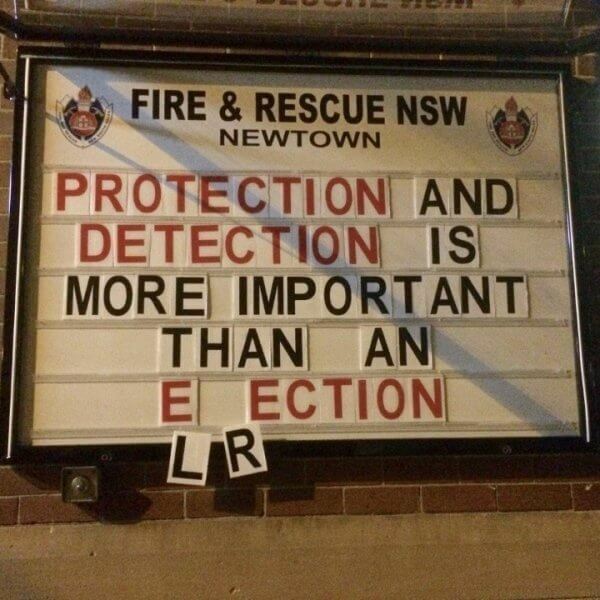 You don’t need to fight a fire that never started, so obviously, prevention is the most important part. But, accidents happen. With fire, time is of great importance as fires can spread quickly, limiting your ability to control them. This is where fire detection systems come in, their goal is to ensure you can respond as quickly as possible to a fire, before it gets worse. There are two types of fire detection – manual and automated. It’s a bit more than sniffing the air and going “Does that smell like smoke”? Manual fire detection means conducting round-the-clock checkups in the engine room and other areas where there isn’t constant supervision but fire is still a danger. If your vessel is particularly big, or you can’t afford to dedicate crewmembers to perform these checkups, you can use CCTV to observe these areas from the bridge. Using fire and heat detection systems on your vessel is very important and demanded by SOLAS regulations. The systems include smoke, heat and CO2 detectors, connected to a fire alarm switchboard that goes off when it needs to. In some cases, these automated systems will also activate sprinklers or other fire fighting systems without human intervention. However, the main role of fire detection systems is to alert the people onboard that there is a fire. So you probably want to verify these systems work. You can’t rely fully on automated systems, even when they do function as expected. If the fire alarm circuit is the first to burn in a fire, you still need to make sure you get alerted in time. So balance manual and automated fire detection. You can’t be too careful when it comes to fire. Odds are you are not a fully certified firefighter. There’s even a good chance that, other than your STCW training or advanced firefighting course, you never had to extinguish a fire raging out of control. To ensure your team and boat are safe, you need to connect to your inner childhood dream of being a firefighter, and develop a love for hoses and extinguishers. Different classes of fires, demand different solutions. Fortunately, these too are classified according to fuel type. Class A – General Fire: Burning wood, paper and fabric can be safely extinguished with water. Class B – Oil Fire: Fuel, oil and grease fires should be extinguished with foam type extinguishers. Class C – Electrical Fire: CO2 extinguishers are used to remove air and heat to gain control of the fire. Class D – Chemical Fire: These need to be handled according to each material’s unique properties. DCP (Dry Chemical Powder) extinguishers can be used on A, B and C class fires. Another method for dealing with fires, specifically in machine rooms and cargo areas, is installing CO2 flooding systems. To comply with IMO regulations, your ship will have to meet pre-defined standards for fire safety. These standards demand that you set clear protocols for dealing with fires, the locations of fire extinguishers and more. Failing to comply with these regulations will not only endanger your crew and vessel, but can also get you into legal problems in case of an accident. Not only do you need to ensure all your fire fighting equipment is according to regulatory demand and is functioning correctly, but you also need to plan for evacuation in an extreme case. Fortunately, this task shouldn’t fall on you alone. Preventing fires and learning how to successfully fight them is a team sports, so your crew should be involved. Those who aren’t involved directly should still be trained and instructed on fire safety and ship wide procedures in case of fire. Neither you or your crewmates are about to become firefighters. Nor should you develop a phobia of ship fires. You should, however, ensure your crew is not making igniting mistakes, and provide them with information and training instructing them what to do in case of a fire. By taking preventative measures and training your team to comply with fire safety protocols and procedures, you can save lives and prevent losses to your shipping business.